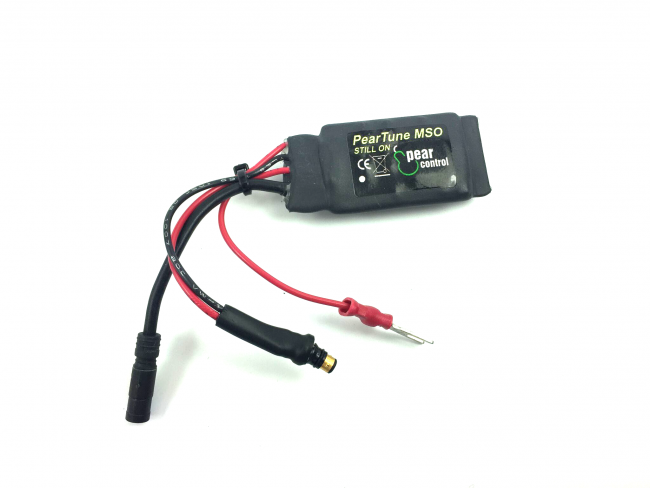 PearTune MSO “max speed off” is a tuning tool for electric bikes with Shimano STEPS E8000 motor. The PearTune MSO SH1 is a tuning module especially for Shimano STEPS E Bikes with E8000 mid-mounted engines (with Di2 gearshift). This tuning tool shifts the maximum engine support from 25 to 50 km/h. Please note: When the tuning module is active, the speed is correctly displayed up to 22 km/h. When speeds over 22 km/h are achieved the speed indicator constantly shows 22 km/h. Since only original connectors are used, the installation is very easy – even for non-technical users. The module must simply be connected between the magnetic speed sensor and the motor unit. After the installation no manual settings have to be made, so the module practically configures itself. The power supply of the PearTune MSO is provided by the light connection of the e-bike. Dimensions of the module: 21 x 40 x 12mm.